A block from the village and the June Lake Marina! Come relax in June Lake. All seasons have something for everybody in this amazing alpine setting. June Lake sits at 7,500 feet and is surrounded by lakes and the stunning Sierra Nevada Mountains. For generations, this town has been the perfect vacation destination and soon it will be yours! Spring comes alive with wildflowers, creatures, and of course, the start of the fishing season! The trout are plentiful in June Lake, Gull Lake, Silver Lake, and Grant Lake. Summer offers more fishing, boating, paddle boarding, swimming, biking, and hiking! There are trails fit for people of all ability levels in June Lake. Take a stroll around Gull Lake or get out in the backcountry to access famous trails like the Pacific Crest Trail or John Muir Trail. Knowing that only a small group of people get to see the pure, untouched beauty of the backcountry makes it simply breathtaking. Something else not to be missed is the fall colors in June Lake and the surrounding areas. Aspen trees turn to gold and orange which make a stunning backdrop. 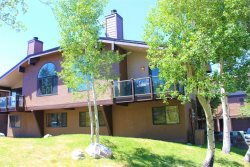 When the snow starts to fall, this condo is only a five-minute drive from June Mountain Ski Area. This ski area is great for kids, beginners, powder chasers, and backcountry skiers. Also, Mammoth Mountain Ski Area is only 25 minutes away! June Lake is an ideal, centrally located place to stay if you want to explore the East side of the Sierra Nevada Mountains. Plenty of world-class attractions are within close driving distance, including Yosemite National Park, Bodie State Park, Devils Postpile National Monument, and the mysterious Mono Lake. Sierra Suns 2 has recently gotten a lot of much needed TLC. New paint, new flooring in bathrooms, all new HD flat screens, new mattress and new furnishings! Enter this charming condo and find a washer/dryer, extra storage space, and a bedroom with a private bathroom. This bedroom has two queen/twin bunk beds with a new HD flat screen TV. Upstairs you will find a living room with comfortable couches, a new HD TV, and a wood burning stove. From the living room, there is a balcony complete with a gas BBQ. The kitchen is fully equipped and has a counter with seating for 2 as well as a dining room table that seats 8. There is another bathroom and bedroom on this level with a king bed and new HD TV. The loft has two queen/twin beds. With nine separate beds, this condo is perfect for large groups or families with kids. I always use your rentals this is my third time. In my opinion you get what you pay for. Your rentals are a good value for a bunch of would be anglers. We have been coming up to the June lake loop for a family fishing trip for 29 consecutive years. We have camped and rented cabins or condos through out the years. June Lake Accommodations has been the friendliest and provided the best service. This is the best condo for our group. We will stay in this unit again next year. 25% deposit to hold your reservation, balance due 30 days prior to arrival. Please let us know if you might arrive after 5pm so we can arrange an after-hours check in.